Throughout history, there have been countless impractical weapons that were overly complicated, poorly designed, or simply conceived in the wrong era. Many of these weapons straddled the border between innovation and uselessness. Surprisingly, some were even officially adopted by militaries all over the world despite their inherent flaws. The Vandenberg volley gun was a multibarreled, breech-loading weapon developed in the 1860s by General Origen Vandenberg. The gun fired .45-caliber rounds simultaneously from as many as 451 barrels. These barrels had to be individually loaded each time the gun was fired unless the user had a special tool that loaded all the barrels at once. This produced an extremely slow rate of fire and could leave the gun crew exposed for an extended period of time. Volley guns were also heavy and time-consuming to clean. However, they were reasonably accurate. The Vandenberg volley gun was first marketed to the US military and then to Great Britain, but both rejected it. Despite the gun’s shortcomings, General Vandenberg managed to sell a few to the Confederacy. One was supposedly used during the Siege of Petersburg, Virginia. The matchlock musket, one of the first successful firearms, was not without its faults. To load it, a small amount of gunpowder was placed in the flashpan, which was then closed. Next, powder was poured down the barrel. That was followed by a patch and a lead bullet. It was estimated that a soldier went through 2 kilometers (1 mi) of match cord per year. Often, the soldier lit both ends of the match in case one end went out. This accelerated the rate at which the match was consumed. As you can imagine, this produced a logistical nightmare for the people who supplied thousands of soldiers with enough match. Users also faced the constant danger that a burning ember from the match would ignite the gunpowder kept in capsules on their belts. The matchlock was phased out with the development of the wheel lock and eventually the flintlock. The Hale rocket, a spin-stabilized projectile fired from a metal tube, was used by the US military in the middle of the 19th century. The jet vents in the bottom of the rocket were drilled in at an angle. Along with the tail fins, these jet vents were intended to keep the rocket on target by causing it to spin. However, this system rarely worked as it was supposed to. The Hale rocket was designed by English inventor William Hale in 1844. As these rockets had a record of erratic flight and premature explosion, they were only used a handful of times during the Mexican-American War, the US Civil War, and the British Crimean War. Sometimes, the rockets even flew back at the crew that fired them. Although Hale rockets were not effective, they had great psychological impact on the enemy because of their random nature. The Hanes grenade (aka the Excelsior) was developed during the early 1860s for the Union Army. It was a hollow metal sphere that was filled with explosives. It had 10–14 metal protrusions on which percussion caps were placed. When the grenade hit a hard surface, a percussion cap would detonate and blow up the grenade. When they were not armed, these grenades were stored in a metal case which had two halves that screwed together. As you might expect, it was easy to unintentionally set off these grenades. As a result, they were never officially adopted or used in combat. The Ketchum grenade was more successful and actually saw combat at Petersburg and Vicksburg. Several other types of grenades, such as the Rains grenade, were essentially rip-offs of their Northern counterparts. They were also tested by the Confederacy, but all of these grenades were unsuccessful. 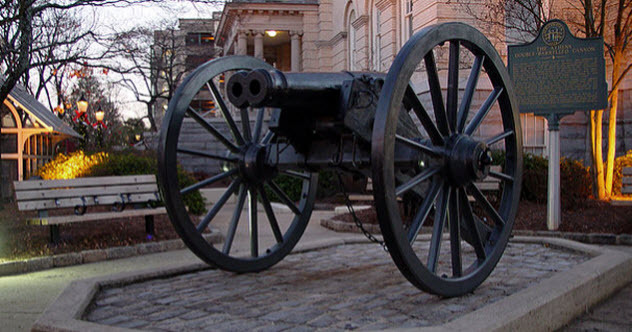 Designed for the Confederate Army in 1862, the double-barreled cannon fired two cannonballs simultaneously. It was invented by John Gilleland and cost $350.00 to manufacture. The cannonballs were connected by a chain and were supposed to spin around in flight, mowing down anything in their path. However, during testing, it was found that the two barrels rarely fired at the same time. When they did, the results were far from accurate. During one of the tests, the cannon destroyed some trees, knocked down a chimney, and killed a cow. All of these were far from the intended target. Despite the pleadings of Mr. Gilleland, the Confederate government and the state of Georgia both considered the cannon a failure and refused to adopt it. Aside from a brief skirmish, the cannon was never used in any battles. Today, it sits outside city hall in Athens, Georgia. The M50 Reising was a submachine gun that was adopted by the Marine Corps during World War II. It was intended to supplement the Thompson because the latter could not be produced in sufficient numbers. The Reising also weighed less than the Thompson and was much cheaper to manufacture. It was commonly fed from a 20-round, detachable box magazine. The M55, a paratrooper version with a folding stock, was also issued. Although the Reising looked good on paper, it was ill-suited for the environment in which the Marines fought. The gun often jammed because of sand and fouling and was difficult to disassemble for cleaning. Many of the parts were hand fitted at the factory, so they weren’t interchangeable between weapons. This created a problem in the field when many soldiers cleaned their weapons at the same time. There was even an instance when the Marines threw their Reisings into a river in favor of the bolt-action 1903 Springfield. After the war, many police departments bought the remaining Reisings and used them in a much more suitable environment. Although the Type 94 is considered the worst pistol ever made, some consider the Chauchat the worst light machine gun ever made. The Chauchat was manufactured for and fielded by the French army in World War I. Among the weapon’s many faults, the bolt had a tendency to lock in place when overheated. The gun was effectively useless until the metal cooled down and contracted to its original size. The design of the magazine was even worse. The Chauchat used an oddly shaped, curved magazine with large cutouts on its right side. These cutouts were supposed to allow the assistant gunner to see how much ammunition was left. In reality, they caused constant jamming in the muddy trenches as dirt and grime collected in the magazine and action. The user also had to be sure that his cheek was not resting on the end of the recoil mechanism, or the mechanism could hit him in the face. The Chauchat was overly complicated, and the quality of manufacturing was often subpar. A few examples were also chambered in .30-06 for the US military, but they were found to have even more problems than the original chambering of the 8 mm Lebel. The bombard, a large-caliber cannon used in the Middle Ages, fired huge cannonballs that were individually carved out of solid stone. The cannons were cast from bronze or made from iron bands that were fitted together. Early bombards were effective at destroying the walls of castles even though the stone projectiles often shattered on impact. 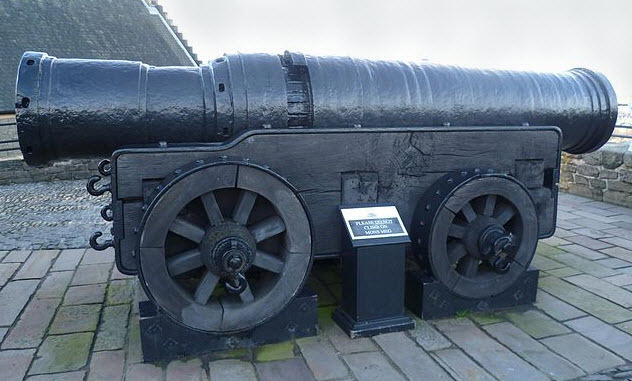 A single bombard weighed many thousands of pounds and a cannonball many hundreds of pounds. This made transporting and aiming the weapon a monumental task. The bombard was also difficult to load and had a slow rate of fire. One of the most famous examples is Mons Meg. It was built in Scotland in the 15th century and now resides at Edinburgh Castle. Bombards were gradually phased out because smaller, more transportable cannons which used projectiles moving at faster speeds were more accurate and effective. 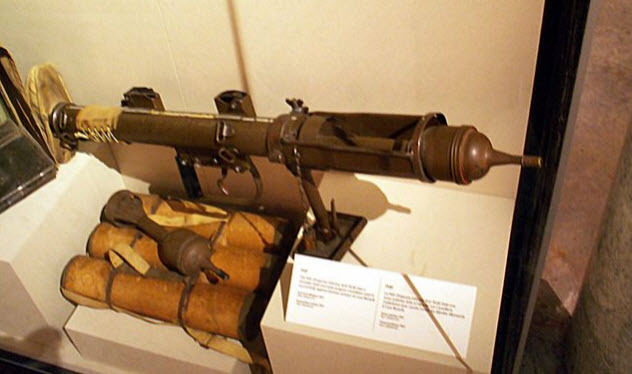 The PIAT (“Projector, Infantry, AntiTank”) was a British antitank weapon that fired a hollow charge. In the early 1940s, it was invented for the British military so that they could take on the heavy armor of German tanks. The weapon did its job well until metal skirts were fitted to the tanks. These skirts caused premature detonation of the projectile and prevented it from damaging the tank. 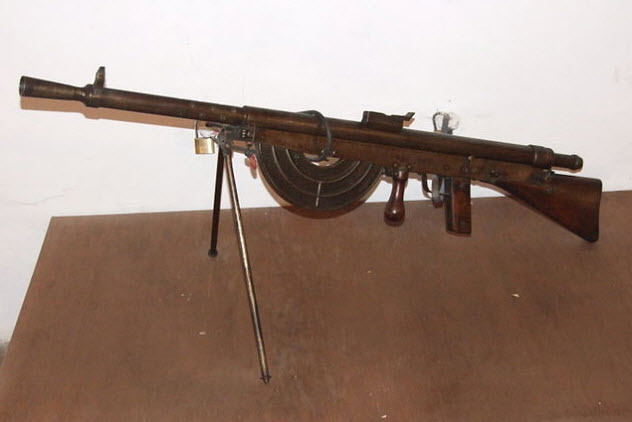 The PIAT was also notorious for its recoil, which left most users with nasty bruises. The PIAT’s trigger mechanism had a powerful spring that had to be cocked to fire the weapon. This was a difficult task for many of the soldiers. During this process, the PIAT had to stand on end, which exposed the soldier to incoming fire. Finally, the build quality, especially the barrel, was known to be less than optimal. Despite these shortcomings, the PIAT stayed in service with the British military through the Korean War. The Krummlauf device was a bent barrel attachment that fit on the end of a StG 44 rifle. The device allowed the shooter to maintain cover while firing around corners or to fire from inside a tank. A periscope was fitted to the back of the device. A rear sight inside the Krummlauf was lined up with the post at the end of the barrel to aim it. Krummlaufs were made with both 30- and 40-degree bends. Although this was an innovative design, it had several major problems. For example, when the bullet exited the barrel of the StG 44 and entered the Krummlauf, it lost considerable velocity due to vent holes that reduced pressure to prolong the life of the device. Nevertheless, the Krummlauf wore out quickly compared to a normal rifle barrel. The device had to be replaced often. Bullets also had a tendency to shatter in the curve of the barrel. This produced a shotgun effect and rendered the device inaccurate. Aaron enjoys studying history and reading books.